FreeViewer MBOX Viewer is a top-notch software that allows users to view and access the MBOX file in a sophisticated way. With the help of this tool, one can efficiently view and analyze MBOX file, which is created in 20+ email applications. Moreover, it also permits users to open and view MBOX files, which is corrupted. 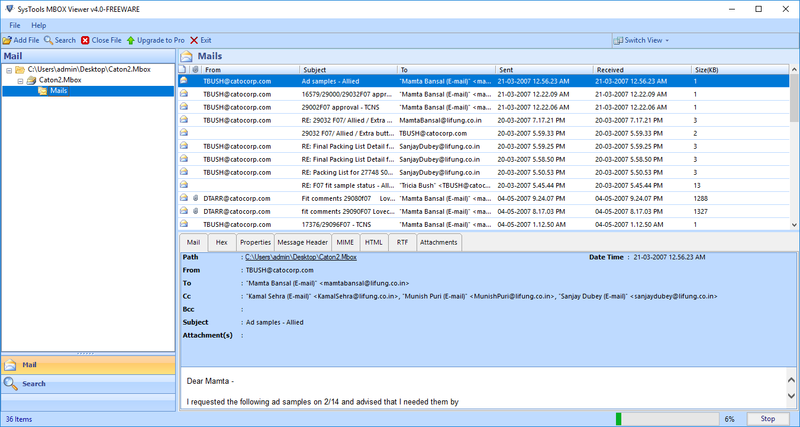 One can seamlessly preview MBOX mailbox data, which includes emails, contacts, calendars, etc. 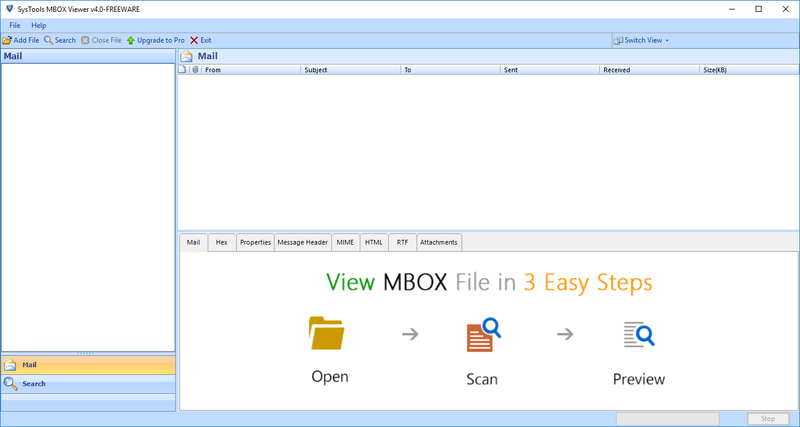 Moreover, it offers multiple preview modes like Normal Mail View, Hex View, Properties View, MIME View and so on to thoroughly examine the MBOX file. 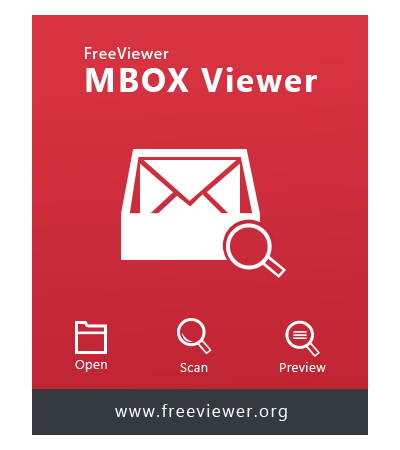 FreeViewer MBOX Viewer tool is a standalone software to view and analyze MBOX data items without the need of installing the supported email client applications. This makes easy for a Digital Crime/Forensic Investigator to read the email headers of the orphan MBOX file in a hassle-free way. This software is absolutely free of cost and easily gets downloaded on all Windows Operating System from Windows 98 to the latest Windows 10 OS. One can fetch the information bit-by-bit with the help of Hex View, which is one of the preview mode options. Apart from that, one can also adjust the email view preference using the horizontal or vertical view. The software supports different MBOX supporting email applications, which includes Thunderbird, Pocomail, Apple Mail, Berkeley Mail, Eudora, Postbox, Outlook Express, Entourage, Windows Live, The Bat, SeaMonkey, Mutt, Claws Mail and so on. Once the user uploads the desired MBOX file in MBOX file viewer software panel, then the complete preview of the MBOX data items are displayed. This includes Normal Mail View, which shows the general details of the email message such as subject, sender, receiver, date/time and so on. Hexadecimal email view allows checking the integrity of the message to the analysis experts. 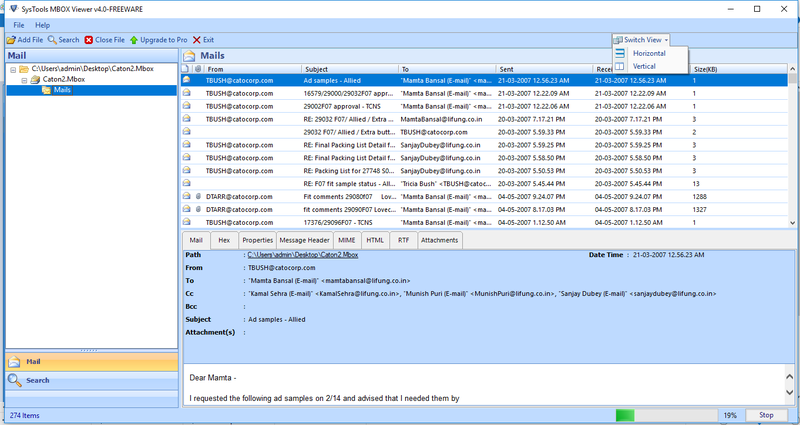 Properties View enables to know the number of MUAs/MTAs in which the mail has traversed, the send/receive protocols used, timestamps and other email details are known here. In the Message Header View, one can instantly view MBOX email headers, which include the routing details of message over different mail server. MIME View help you determine the content type in the mail, server routing, IP address, and various other minor details. The HTML View modes allow users to know the HTML code that is been created at the back end. While RTF View displays the plain text of the email message that is composed in RTF format. The last View i.e., Attachments includes the item that can be an image, document or a spreadsheet, which is been attached to the email message. In the case of opening and viewing the email headers, then this Freeware MBOX file reader utility is the best tool to curb all viewing needs. This is because the tool is induced with the set of amazing features that provides a cost-effective solution to read MBOX file without facing any technical disputes. 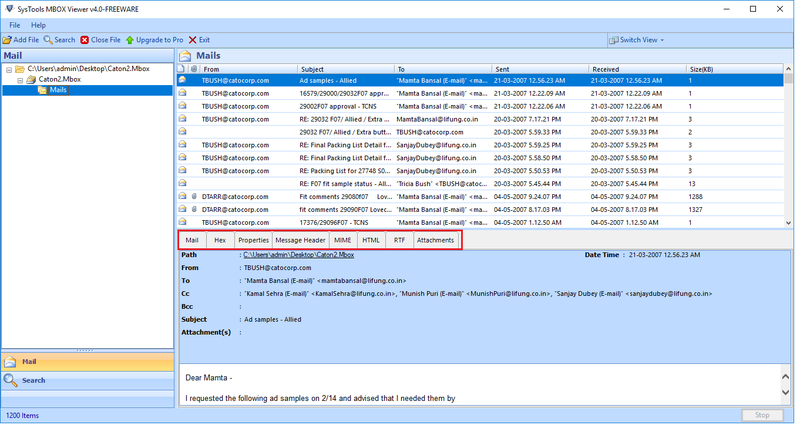 This MBOX Viewer tool renders a complete solution to view and analysis the MBOX file that makes users to conveniently analyze the email headers with regards to a Digital Forensic Examiner or an Investigator. One can comfortably open and view MBOX file freely and in case of converting the MBOX file to PDF format, PRO version is also made available to mitigate the user’s requirement. It is also capable to open bulk MBOX files altogether for an instant and quick analysis of the email headers. With the endless features offered by the MBOX reader tool to read and open MBOX file freely is enough to adopt this program. This free MBOX Viewer tool is the best alternative to beat all MBOX viewing needs. Moreover, this trouble-free software mesmerizes every single user with a plethora of features that makes easy to read even the corrupted or inaccessible MBOX files at ease. It is capable enough to recover all the corrupted data like email messages, contacts, calendar items without the need of installing any bulky software. All the mailbox data that is been stored and saved in MBOX format can be smoothly read through MBOX Viewer tool without installing any MBOX supported email programs. It allows reading the mail data that is exported from the Google Takeout feature. So now, upgrade to PRO version to import Google Takeout data into MS Outlook. This tool is also capable to read contents from different variants of MBOX file like MBX, MBOXCL, MBOXO etc. This FreeViewer MBOX Reader is a trusted Windows MBOX reader tool, which efficiently opens the MBOX file independent of the email client. Apart from that, it offers 8 distinct views to read the emails, which is saved in the MBOX mailbox item. The various mail views include Normal Mail, Properties, MIME, HTML, RTF, etc that renders a seamless approach to read and analyze MBOX file. All the Thunderbird emails are saved in two different files i.e., MSF and MBOX. While MSF is a summary file, which is used to record the index of email data and the MBOX file is the one in which all the messages are stored. In order to extract the messages from the MBOX file, one needs to install an add-in i.e., ImportExport Tool. Moreover, the email messages from Thunderbird email client can also be read by this mesmerizing MBOX viewer tool. Instead of reading the binary numbers, which is quite complex to understand. The software generates a separate HEX view for text, images, videos, etc. This HEX view helps users to know the integrity of an email along with its properties. In the case of a digital investigation, the HEX view allows finding the email forging while it’s traversal to the receiver. With the help of this freeware MBOX file reader utility, one can perform the search function advancely. In order to search any data from the MBOX file, one can search that particular email or the data by specifying relevant details so as to effortlessly fetch the data. So now, by availing this MBOX viewer tool, it is no more a complex task to search the data even from a large-sized MBOX file. For the purpose of viewing an MBOX file with a wide range of countless options can turn their attention to MBOX Viewer Pro and Pro Plus version. With the help of these advanced versions, one can flawlessly open and view MBOX file. Apart from that, it also provides the option to convert the MBOX file to Adobe Acrobat PDF format within a short span of time. 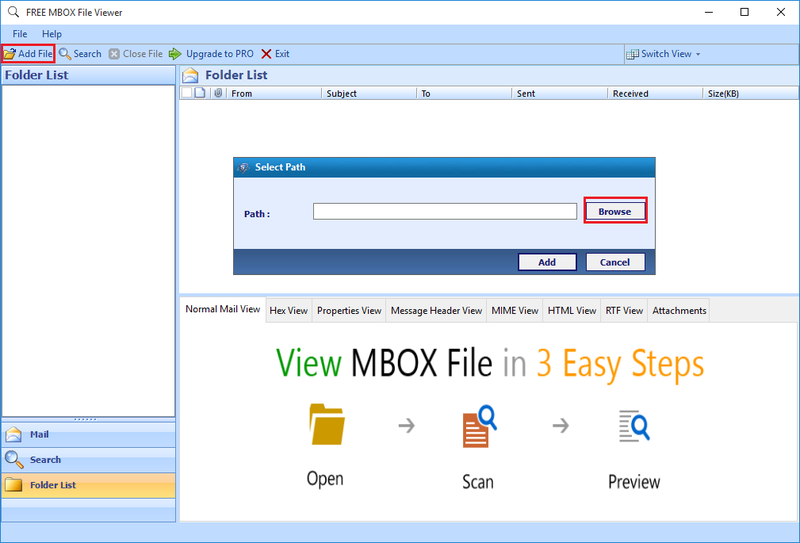 Free MBOX Viewer only preview MBOX file's Emails with Attachments, Upgrade to MBOX File Viewer Pro for Advance Search Option & Export MBOX Emails into PDF Format. Does this FREE MBOX Viewer Software opens .mbox files without having any file extension? Yes, MBOX Viewer Tool supports MBOX files without having any file extensions. Is there any file size limitation to open MBOX files? No, there is no such file size limitation and user can open files of any size with the MBOX file opener tool. Can I open multiple .mbox files at a time in MBOX file viewer? Yes, user will be able to view Multiple .mbox files simultaneously in free MBOX file reader software. Is there a way to save email messages from .mbox files using FREE MBOX Viewer Tool? The conversion is allowed in the pro version of the MBOX file opener software. Can I recover my corrupt MBOX file with this MBOX reader utility? Yes, you can repair as well as save the recovered file easily with this MBOX file viewer program. Just provide the location of your corrupt MBOX File and after scanning you can easily store and open the recovered MBOX file anywhere. Can I convert my GoogleMail mailbox exported from Google Takeout option? 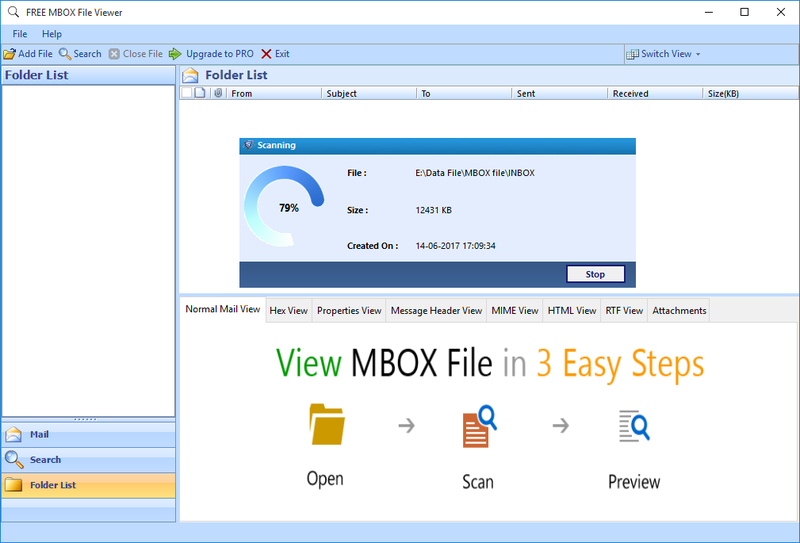 Yes, You can buy our MBOX Viewer Pro Plus version to export your Google Takeout mailbox into multiple formats such as PDF, EML, MSG, PST. The four conversion option gives you full liberty to change the email messages to the format you desired. How to recover the password protected MBOX file? You can easily recover the content that reside in the password protected MBOX file. The process to recover the password protected MBOX File is easy, just provide the file location and the MBOX file opener software will decode the MBOX file automatically, after scanning all the content will be visible that can later be saved separately without password. "I was recently in a big trouble as I was not able to view my email messages that contained important attachments. I never imagined that viewing the contents of my MBOX files would be so easy. 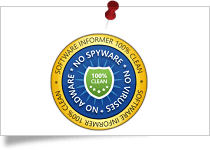 Seriously no other free software are matched upto the level of this MBOX viewer software." "Recently was frustrated as I found no solution for my corrupt MBOX file, I downloaded your MBOX File Reader Tool and was able to view all my files easily. For users like me the software works as a charm, just download – locate and view all the files. Sincerely want to thank the entire team of Free MBOX File Viewer." FreeViewer OST Viewer Tool helps user to open offline Microsoft Outlook OST file with attachments without having Exchange Server environment. 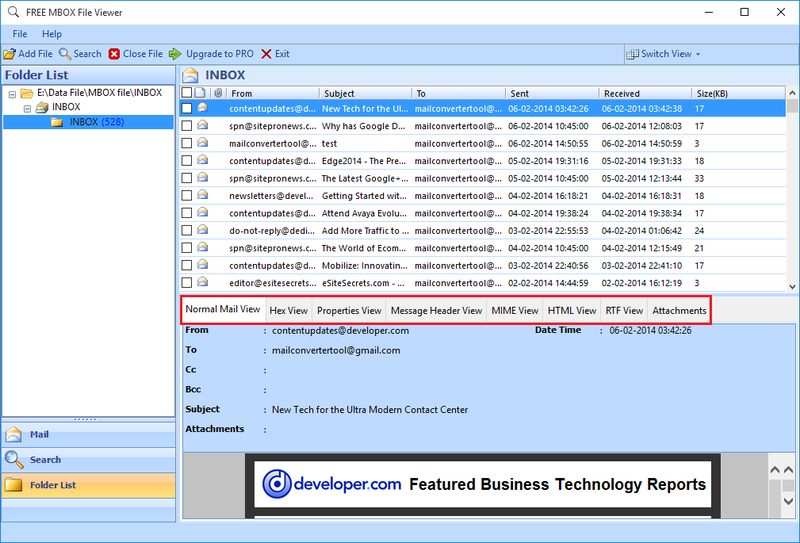 FreeViewer MSG Viewer Application used to open single or multiple Outlook email messages. Open MSG file with associated Email attachments. FreeViewer introduces OLK Viewer tool, This can easily open Mac Outlook 2011 & 2016 identity folder files. Open OLK14Message & OLK15Message files.